200 Delaware, Maryland and Pennsylvania Regional artists are pleased to invite you to purchase artwork directly from them priced at $250 or less. Artwork available in pottery, painting, fiber, mixed media, jewelry, photography, watercolor, wood, metalsmith, digital, collage, illustration, mosaic, screen printing, sculpture, printing, glass, and drawing and more. Atrium Art Gallery, University of Southern Maine, Lewiston-Auburn College, 51 Westminster Street, Lewiston, ME 04240. September 8 - December 18, 2009. Reception, Friday, September 18, 2009. "Spineless Wonders" celebrates the diversity of species for the 2009 bicentennial of Charles Darwin's birth and the 150th anniversary of "On the Origin of Species." "Decades ago, when a husband and wife moved into their new home, a friend gave them a painting by the man's former college professor. Fast-forward 40 or 50 odd years and the oil painting, still in the same family, is appraised during an "Antiques Roadshow" stop in Palm Springs, Calif., for a cool half-million bucks - the most valuable object ever discovered in the show's history." From what I am told, the annual MFA auction at Penn is a hot ticket in town and usually sells out. As I've often advised, student artwork is a great way to get started collecting art and this auction is a great a good place to start, although it is also attended by a lot of savvy collectors. It takes place this coming Friday, Nov. 21st to benefit the 2009 MFA thesis exhibition. Again... there you will find one of the nation's best venues to get some good original artwork on your walls and finally get rid of those college posters (and if you are a gallerist, a terrific opportunity to scope out some new talent). 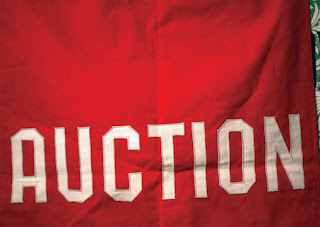 The auction is from 5:30-9 PM at the University's Meyerson Gallery. Work from over 40 artists will be available including work by Terry Atkins, Jane Irish, Doug Martenson, Eileen Neff, Nigel Rolfe, Judith Shea, and Jackie Tileston. The art being offered includes drawings, paintings, ceramics, prints, sculptures, and photographs. There will also be gift certificates from Philadelphia restaurants and businesses. Everything is affordably priced with some items starting as low as $10. Appetizers, beer, and wine will be served and DJs will provide music through out the evening. Free and open to the public. For more information check out this blog or contact the Graduate Department of Fine Arts at the University of Pennsylvania at 215-898-8374. The gallery is at 210 S. 34th St. at Walnut. For building locations on Penn's campus, please consult the online maps here.